Anyone with even the slightest understanding of math knows that playing the lottery is a good way to throw your money away. The odds of winning are downright terrible. And yet, every time the jackpot gets sky-high, even the most pragmatic statisticians out there will pony up a few bucks for a chance at sweet, sweet instant wealth. That's especially true this week, since Tuesday night's Mega Million's estimated $1.6 billion grand prize (as of Monday) will be the largest in United States lottery history. With that in mind, you're probably curious exactly how slim the odds of winning are this time around, so to help you figure out whether to shell out $2 for a ticket, we've pulled together a few things worth considering. If you're like most lottery players, you'd likely take the lump sum payout, which in this case will be around $904 million. And while that's nothing to sneeze at, after taxes you're looking at getting roughly half that. If you opt for the annuity, you're looking at more money overall, but it will also be taxed, and paid out over 29 years. Even though people are quite literally lining up to buy their tickets now that the jackpot is so high, your odds of winning the jackpot (e.g., matching all five numbers and the Mega Ball) are just the same as they always are when playing Mega Millions: 1 in 302,575,350. To put that in perspective, you have a better chance of being struck by lightning this year (odds: 1 in 700,000) or becoming a saint (odds: 1 in 20 million). However, the odds of you winning the jackpot are higher than some other rare things happening, like having a perfect NCAA bracket, according to Sports Illustrated. You don't need to match all the numbers to walk away with a bunch of cash, though. In fact, you have relatively decent odds of wining something. 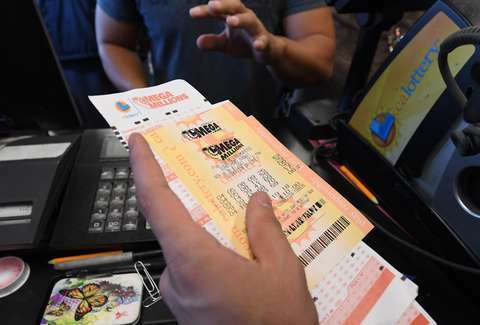 For instance your chance of getting $1 million (matching five numbers with no Mega Ball) are 1 in 12,607,306, while the chance of winning $10,000 (matching four numbers with no Mega Ball) are 931,001. You also have a vaguely decent chance of matching just the Mega Ball and winning your $2 back (odds: 1 in 37). And overall, the odds of winning any prize are 1 in 24. Of course, it's always possible that multiple people will end up with jackpot-winning tickets, in which case, it's divided evenly among them. Though, if again there are no tickets sold with the winning numbers, the pot grows even larger for the next drawing on Friday, October 26. Considering how many people are buying in, that one would likely have a jackpot of well over $2 billion. If you do find yourself in the enviable position of buying a winning ticket, there are a few very important courses of action to take in the immediate aftermath (hint: sign your ticket, don't tell anyone, and hire a professional). Then again, you could always just set your sights on becoming a millionaire the old fashioned way without the help of the lottery, in which case the odds of doing so before age 40 are relatively decent at 1 in 55. Either way, good luck out there.